Top Ten: San Antonio River Walk. 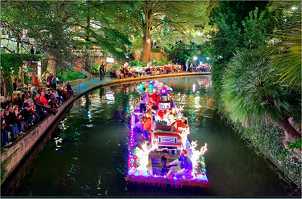 • Thousands of twinkling lights illumine San Antonio's River Walk for the holidays with a spectacular parade of floats, celebrities and other entertainment kicking off the holiday season. Check out the photo (right) to see why San Antonio is usually rated the Top Ten Places in Texas to visit for Christmas. • They don't call Grapevine, TX the Christmas Capital of Texas for just any old reason. More than 1,400 events take place from mid-November to early January including Christmas movies at the Historic Palace Theatre, holiday wine train tours, a North Pole express for the kiddies, and the ICE! show at Gaylord Texan Resort which uses 2,000,000 pounds of ice to create huge holiday ice sculptures. • For one of the biggest holiday light shows in the nation, check out The Wonderland of Lights extravaganza in Marshall, TX. It features 10 MILLION lights that bathe the town in Christmas cheer throughout the season -- along with a light parade, an outdoor ice skating rink, and an old fashioned Christmas market. • For a trip back in time, head to the oldest town in Texas for the Nine Flags Christmas Festival in Nacogdoches, TX (founded in 1779) that includes an antique toy and ornament exhibit, a Victorian Christmas celebration, a holiday parade, and visits with Santa. Home for the Holidays in Old Town Spring - A major Houston area attraction including the official tree lighting, holiday entertainment, photos with Santa, ice skating and a festive train ride at Thyme Square. Moody Gardens Holiday Season - Galveston Island celebrates with thousands of twinkling holiday lights, a giant Christmas tree, a visit to Santa's workshop, nativity scene and gingerbread house, with live music and other festivities through December. Dallas Christmas Festival - One of the nation's biggest Christmas pageants features spectacular onstage performances and a gala holiday buffet at the Prestonwood Baptist Church in Plano, with the complete schedule and online ticket purchase. Holiday at the Dallas Arboretum - Find your way around a Christmas tree maze with special events featuring horse-drawn carriage rides, choraling, and visits with Frosty the Snowman, Rudolf the Red-Nosed Reindeer and, of course, Santa. Prairie Lights - This is an awesome 2-mile drive through 4 million lights at Lynn Creek Park in Grand Prairie, featuring a 10 minute Holiday Magic light show choreographed to music. Catch it Thanksgiving to New Year's Eve. Armadillo Christmas Bazaar - Here's the downtown Austin holiday tradition offering festive entertainment and shopping for unique local arts & crafts. We Believe in Christmas - Jeff and Rhonda show you how they decorate their San Antonio area house with a gallery of photos, hours, dates, maps and directions.